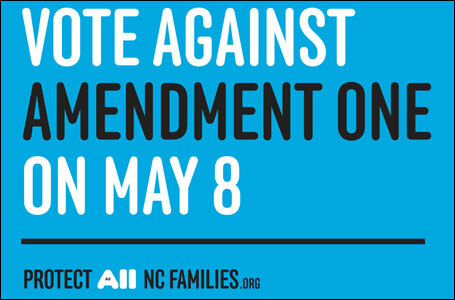 Posted on May 7, 2012, in Culture, LGBT and tagged Amendment One, marriage equality, North Carolina. Bookmark the permalink. 3 Comments. While I totally agree with voting against Amendment One, I don’t understand how its passage would “give companies a reason to avoid NC because the status of their employees’ benefits would be uncertain?” There are already states do not require companies to cover domestic partners of their employees the same way they provide insurance or other benefits to their employees’ spouses. In addition, just because the state doesn’t recognize domestic partnerships doesn’t mean that a company can’t recognize it. It’s been a depressing evening. NC passed the amendment today.